Spring Break Camp, April 1st - April 5th! Early Bird Registration $165 by March 1st! After March 1st $185 Half Day and $245 for Full Day. 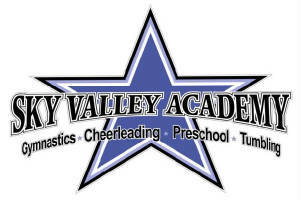 Sky Valley Academy offers Summer Time Fun for your kids. There are 17 different camps to choose from, 2 different camps each week. students will have an organized class beginning at 2:30 to show what they have been working on all week. Bring tennis shoes, wear athletic clothing and a lunch each day! unitard, or any athletic attire. No street clothing, jeans, buttons, zippers, belts, no sweats with big pockets. Come learn the fundamentals of gymnastics including floor, bars, beam, vault, rings, tumbling & trampoline. Our coaches are ready to help you learn and improve your gymnastics skills. Students will learn new skills on each event. They will have one final class on the last day of camp at 2:30 so you can see what they have been working on. positions, tumbling, dance, stunting & jumps. performed the last day of camp. Be a little loud and crazy and have a lot of fun doing it! Learn the basics of parkour movement in a fun energetic environment. Work on getting strong, the importance of conditioning, proper landing skills, learn new tricks on floor, flipping into pit, trampoline and more! Our Ninja Warrior camp is a fun camp learning skills on obstacles like, monkey bars, flying curtains, quintuple steps, giant jump, rock wall, rope swing, ring swing and more. They will learn a variety of tumbling and jumping skills to put into practice on obstacle courses throughout the week. There are challenges each day as a group and as individules. They will also partake in games, contests and open gym time each day. Out of gym activities are done during the morning camp session. Bring a pair o tennis shoes, sunsceen lotion and a lunch each day. All camps will use both gyms each day. Clothing - wear apporpriate clothing for current weather conditions. Sone outdoor activities may be cancelled due to situations out of our control. Please watch your emails for updated from the gym the week prior.